This step is only for systems shipped with Media Direct version 3. If your system does not have Media Direct version 3 skip this step. Note most Dell systems don’t have Media Direct. It is likely there are another two Media Direct 3.5 DVDs. If you have his DVD please create an .iso from it using ImgBurn and load it on Google Drive so we can have all the Media Direct .isos. The Media Direct Button has the symbol below and is in close proximity to the power button. The partitions for Media Direct must be set up before the installation of Microsoft Windows otherwise pressing the Media Direct Button while the system is powered down can corrupt your entire Operating System. The Media Direct 3.3 .iso works only with the following systems MXC061 (Inspiron 640m/E1405), MM061 (Dell Inspiron 6400/E1505), MP061 (Dell Inspiron 9400/E1705), MXC062 (Dell XPS M1210), MXG061 (Dell XPS M1710), MXP061 (Dell XPS M2010). The Media Direct 3.5 for Vostro systems .iso works only with with the following systems Vostro 1400, Vostro 1500 and Vostro 1700. The Media Direct 3.5 for XPS systems .iso works only with with the following systems XPS M1330, XPSM1530 and MXC071 (Dell XPS M1730). This will give you the various checksums and they should match the checksums below. If they are different you will have an incomplete/corrupt download. Power down your computer. 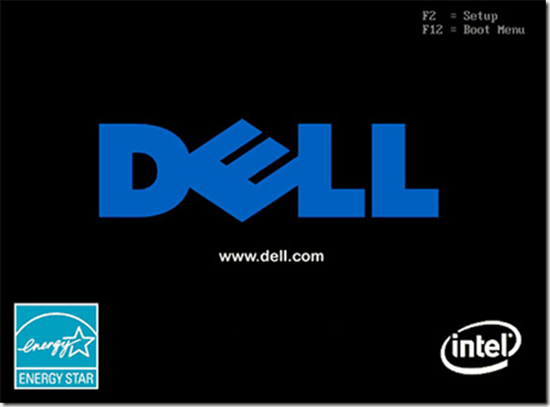 Hold F12 while powering up your computer (at the Dell BIOS screen). Press the [↓] key and highlight CD/DVD drive and press [Enter]. The MediaDirect preinstallation setup will then load. Press  (recommended) or  (if you want a C:\ and D:\ partitions). For  the MediaDirect preinstallation setup will format the drive creating a 47 MB diagnostics partition and a 2 GB Media Direct partition assigning all remaining disk space to the C:\ Drive. The MediaDirect preinstallation setup will inform you it has successfully carried out the operations. Next you need to boot from the Windows Reinstallation DVD/USB. During Windows Installation select the largest partition which should be listed as Disk 0 Partition 2 and then press [Next]. Do not use Drive options or delete any partitions if you want Media Direct to function properly. The Media Direct partition is 2 GB for a Media Direct 3.3 DVD and 3.0 GB for a Media Direct 3.5 DVD. The diagnostics partition is 47 MB in both cases. 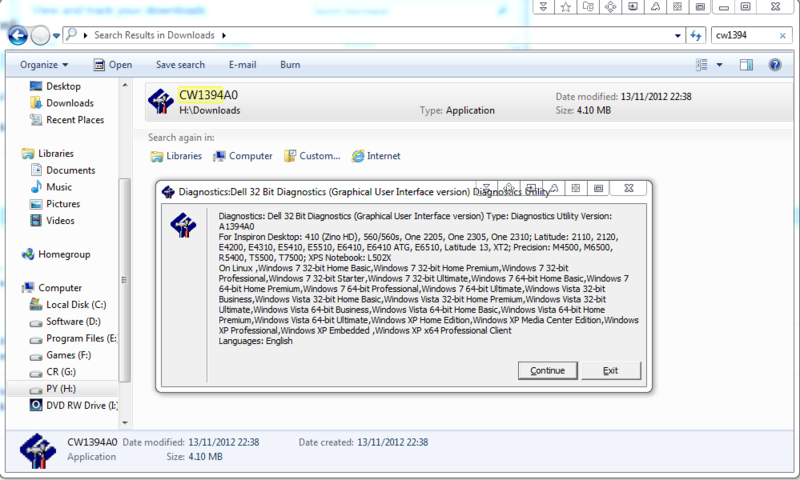 Note: The application must be installed after the system drivers including Dell Quickset while on the Windows Desktop. Once on the windows desktop, insert the media direct disc; it should autorun follow the onscreen instructions to install the application. If it doesn’t you should navigate to the WindowsMD3 folder and click setup.exe. You should then run the following patch R157449 to get to the latest version. 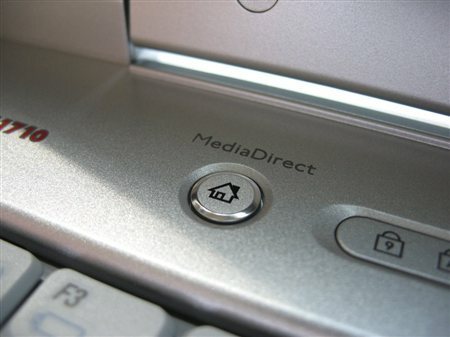 The Media Direct may now be pressed within Windows to load Media Direct or Media Direct Launched when the system is powered up using the Media Direct Button. I have tested this on the Inspiron 6400 with Windows 7 and 8.1 32 Bit and found full functionality. I have tested this on the Inspiron 6400 with Windows 7 and 8.1 64 Bit and found that the button doesn’t work within Windows due to the Dell Quickset Application. It can still be launched via the Start Menu and accessed when powered up with the Media Direct Button. 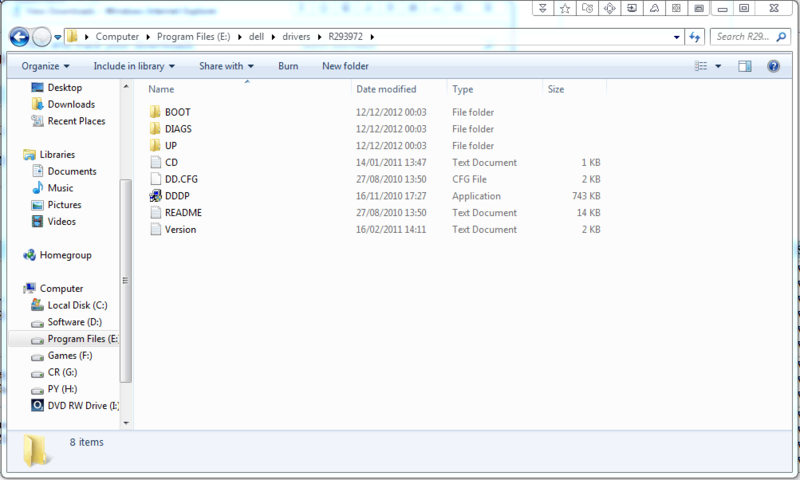 Unfortunately, the steps to extract and burn Media Direct 3 files to a DVD did not make the DVD bootable. Files are there, but the DVD cannot be boot into by any laptop. Please advise. It worked for me, the original .iso was created with ImgBurn. Did you use ImgBurn to burn the disc? why are we only using 1/10 files? what do you use the other 9 for? When you use 7zip, it will extract the .iso from all 10 file fragments but you need to tell it to extract the first one. When I extracted the first file using 7zip, it extracted all files and folders into a specified folder (named “MediaDirect3.iso”), rather than a single .iso file. It’s as if the 10 files are treated as a single big .zip archive. ImgBurn was then used to burn the files and folders to a DVD, but this resulted to a DVD not being bootable from any laptops. I got time today to redownload and test. My instructions above were slightly wrong and have now been amended. Combine should be used instead of extract. Please follow the new instructions above. Launch 7zip navigate to where you downloaded the files using 7zip window. Right click on Mediadirect3.iso.001 click combine files select where you want the combined files to be saved to and wait till its done there should be an ISO file in the directory you selected to save the files to. Going for Dell 1520 XP upgrade to 8.1 using full version install disk choice of “Custom” followed by PCMover Upgrade Assistant instructions. Do I still need to prep drive with Media Direct install (since I thought Custom would preserve my 3.5 MD already on partition)? Any help would be greatly apreciated. I have never used PCMover however as long as you don’t delete the partition/modify partition sizes during the Windows setup it should still work. Thank you, your instructions were excellent! Everything worked perfectly. Hi Sir, Can you please make a download for the Dell MediaDirect 3.5 like you did the 3.3 ??? That would be great! I don’t have a Media Direct 3.5 DVD so cannot make a .iso from it. Can you tell me precisely why we should use 7zip and ImgBurn , as any burner will do the job.ALSO ,WHY ,oh ,WHY am I now finding “Plil Yip ” search engine installed in Chrome…THAT IS ,My CHROME account???????….. 7zip because I split the .iso up using 7zip and have only tested rebuilding the .iso with 7zip. ImgBurn because I made the .iso with ImgBurn and its free. I have no idea what you are on about with the search engine…. I suppose thats meant to be a bad way of spelling my name. Regardless I do not have a search engine named after me. Partitions set up correctly 1. 47MB OEM, 2. 109.7GB System, 3:MEDIADIRECT 2GB Logical. When it comes to installing Windows 10 should I install into the System partition or delete 2 and let windows create its 500MB System and remaining Primary and install into that ? I’ve not tested Media Direct with Windows 10. I have been informed its pointless to setup however as Windows 10 encrypts the drive and booting to Media Direct hence cannot read media files from the drive. You can try to install Windows 10 on the largest partition after setting up Media Direct but I have not tried this. On one of my videos I was told it did work but Media Direct couldn’t access files on the HDD/SSD because it was encrypted. I haven’t personally tried however. Ok thanks will try, so your best guess is to install on the existing partition rather than deleting it and letting windows create its normal 2 partitions for MBR ? Yes otherwise it won’t work. Update – Windows installed ok, Media Direct opens ok and plays Dvd’s from menu item, doesn’t respond to button press in Windows, pressing button when power off results in “NTDLR Missing”‘ solved by pressing MD button again to boot into Windows. Thanks for letting me know. I suspected the NTDLR is missing if the system was attempted to be powered from the MD button. Its not happy with the partitions/Windows 10 boot manager. Media Direct partitions need to be setup before Windows 7 installation. Then Windows 7 is installed on the largest partition with all the system drivers. The Media Direct Application is finally installed alongside its patches. Its honestly more hassle than its worth to setup however. bootsect.exe are likely to only create hassles with Media Direct. The Media Direct partition is meant to be hidden and the easiest way is with a complete clean Windows installation setting up the partitions using the Media Direct DVD then loading Windows and making sure its 32 Bit Windows. Not sure how it fares with 64 Bit Windows. Is there any way to have the media direct button do something else entirely like launch a different o/s. Thankyou for the tutorial Philip, I find it very helpful. I followed all the steps above to reinstall Media Direct 3.5 & Windows 10-32. I did not encounter any problem at all. Powering up Media Direct using MD button works well now & MD works as described. There was no NTDLR or Bootmgr missing problems. I had the NTDLR missing problem in the beginning, which prompted me to reinstall Windows & MD in the 1st place. I didn’t want to see my Vostro 1500 system going corrupt again because of the MD button. Also thankyou for all the comments guys. What version of Media Direct did you use? If you have the DVD for that model, could you install ImgBurn and make a .iso file from it, then upload it to Google Drive? That way I can add it to the collection of Media Direct .isos. Nice to know that its working with Windows 10 32 Bit. 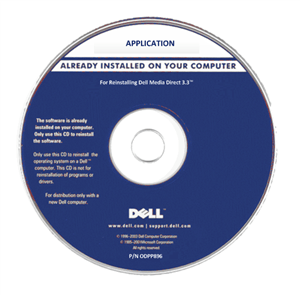 I have a DVD that says “For Reinstalling Dell MediaDirect TM 3.5 on Dell TM Vostro TM Computers” that came with the Vostro 1500. I don’t want to make any mistake. So can you tell me all the steps especially the “uploading to google drive” bit which I have never done before. So that it can be done correctly. Also do you want the ‘Checksum Information’ & how to get it. Thanks I managed to download it and added it to the collection. I think there’s probably one more Media Direct .iso for the Inspiron xx20/xx21 systems. philipyip I would like to thank you for your hard work and persistence ,as I know this would not have been a easy task ! Its a shame Dell does not offer support in regards to upgrading to the newer windows systems as like most that have purchased a Dell laptop paying good money hoping it would last them a few good years and then some . I am about to try the upgrade myself as my xps M1710 is in new condition and cant stand throwing it away . I have the inspiron 1520, Is there any way to make one of those installers work? getting error doesn’t match system id? any workarounds? I upgraded hd to solid state 250GB. Old drive was only 180. First time I used clone hd and imaged whole drive. Gave me the right partitions but left 80GB unused. Couldn’t extend cause there are 4 partitions already. Second time I expanded just the OS drive and left other partitions alone. Media Direct lost its name but partition still there. SHould I use one of the installers to partition then install? or would it not make a difference? I don’t have the Media Direct DVD/.iso for that model. Did you use Macurium Reflect to clone the original drive? If someone uses Imgburn to create an iso of the Media Direct 3.5 DVD for Inspiron, what do they have to do in order to upload it to your drive? If you have the DVD and can make the .iso with ImgBurn, could you upload it onto your own Google Drive and make it public? Then I can Download it and Upload it to mine beside the rest. Dear Philip, you mentioned “Do not use Drive options or delete any partitions if you want Media Direct to function properly.” May I know what do you mean by “Drive options” here? Thank you. If you look at the image below the text drive options. It is of the Windows setup, do not select the Drive Options box but instead just select the largest partition sand then select next.